PT Pertamina (Persero) - Pertamina is the national oil company of Indonesia. Pertamina is a non listed state owned company and is fully owned by the Government of Indonesia which represented by the Minister of State-Owned Enterprises (SOE). 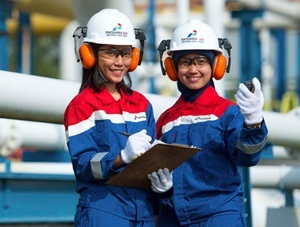 Pertamina is Indonesia’s fully integrated oil and gas company, has main responsible to managing energy resources in Indonesia. Pertamina running business in the field of fully integrated oil and gas industry from upstream to downstream activities. Its business include oil and natural gas, renewable and new energy resources. Based in Jakarta, Pertamina Group comprised 24 wholly owned subsidiaries, 6 associated companies and 6 joint venture entities (As of the end of December 2017). Pertamina now has 6 refinery units and 8 Marketing operation regions throughout Indonesia. According to information found in PT Pertamina (Persero) Annual Report 2017 as cited by JobsCDC.com, Pertamina managed to record revenue of USD 42.96 billion in 2017. This number is up 17.7% from USD 36.49 billion in 2016. Total net profit dropped by 19.3% to USD 2.55 billion, from USD 3.16 billion in 2016. Referring to its annual report, Pertamina registered total crude oil production of 124.73 MMBO in 2017. This number is reflected an 9.4% increase from 114.03 MMBO in 2016. Total assets in 2017 grew by 8.42% to USD 51.21 billion from USD 47.23 billion in 2016. Minimum S2 or equivalent, preferably have an educational background in Physics Engineering or Physics or Electrical Engineering. Required experience for minimum 5 years in the energy field (preferably for those who have experience in Renewable Energy or Solar Power System & Generation, and have experience in design / implementation of Smart Grid). Required experience for minimum 2 years in the research field. Able to carry out laboratory activities, product and technology development and coordinate with internal / external parties in carrying out research activities. JobsCDC.com now available on android device. Download now on Google Play here. Please be aware of recruitment fraud. The entire stage of this selection process is free of charge. PT Pertamina (Persero) - Specialist Renewable Energy Research Pertamina November 2018 will never ask for fees or upfront payments for any purposes during the recruitment process such as transportation and accommodation.